This is a cannabis trade show for industry professionals and consumers alike. Doobie Central began over 17 years ago because we wanted to be able to see Doobie Central brand marijuana legally available for purchase here in Canada someday in the future. That day finally came October 17th, 2018 (only one day after Doobie Central's 17th Anniversary), and now Doobie Central seeks to fulfill its original purpose. We are here to do good business and make good legal business agreements that will see Doobie Central grow and prosper over the next several years. Doobie Central does not have a booth at this years trade show. Instead, we will have one to two people handing out FREE Doobie Central stickers as part of our WEAR A STICKER - GET A STICKER campaign (sticker #3 - collect them all) on all 3 days of the trade show - helping to increase recognition of the Doobie Central brand. Our goal is to increase brand recognition within the emerging cannabis industry. We are promoting the idea of cannabis activism as a brand - so that someday in the future, marijuana will truly be legal. Canada and the world need a marijuana brand that is dedicated to fighting for all cannabis users rights and freedoms. Doobie Central has been that brand successfully - for over 17 years! Vancouver's 420 rally began in the 1990's, but by 2003, the event had petered out. Doobie Central decided to change that, so in 2004, Doobie Central hosted the 420 rally at the Vancouver Art Gallery, and about 200 people showed up that day. Doobie Central even set up a booth openly selling over 2 ounces of cannabis that day. Before leaving, everyone made a vow to bring 10 friends next year. We all kept that vow, and in 2005, over 3000 people showed up. Doobie Central did not host the 420 rally that year, and it was a simple, peaceful gathering on the steps of the Vancouver Art Gallery. In 2006, Doobie Central again hosted the rally, complete with stage, a live band, and an after party for those who volunteered that day. Over 5000 people showed up, making the "2006 Doobie Central Vancouver 420 Rally" the largest cannabis rally that Doobie Central has ever held. This would be the last time that Doobie Central hosted the 420 rally in Vancouver. In 2007, Doobie Central did not host the party, but instead, did a repeat of 2004, openly selling cannabis, selling over 2 pounds that day. 7000 people attended the rally that year, making Vancouvers 420 rally the worlds largest 420 gathering ever! Doobie Central urged others to also set up booths openly selling cannabis, and in 2008, Vancouver's 420 rally became an open air cannabis market, with over 50 vendors openly selling cannabis. While Doobie Central's sales declined due to competition, Doobie Central still sold over half a pound, with many of the customers choosing to not patron the "competition" because we were the "original and best marijuana vendor". With over 50 vendors selling a half pound each, more cannabis was sold that year than in years past, and in the end, Doobie Central declared 2008 a huge success. As for attendance, the event just kept growing, with over 8000 people attending. In 2010, one of our team members took it upon himself to sell Doobie Central brand marijuana underneath the Rock 101.1 FM tent at the rally - without permission from Doobie Central or Rock 101. While we would have approved of him selling Doobie Central bud at the rally that day, we would not have approved of him selling it out of the radio station booth without their consent. We took a series of pictures for laughs and gave him a stern warning. This incident was the inspiration for the artwork on the Doobie Central 420 Rally 2010 coin (see bottom of this page). Internally, we call this coin the "Rock 101" coin - and listen proudly to its groovy rock n roll as we work. In 2013 again, Doobie Central set up a booth at the 420 rally, openly selling cannabis. Doobie Central sold and distributed a half pound of cannabis that day (and in less hours than in 2008). Many customers recognized us from previous years, and made a point of patronizing our booth. Over 20,000 people attended the 2013 420 Rally. In 2018, Doobie Central chose to not set up a booth, but instead, armed with Doobie Central stickers and a video camera, conducted a survey for marketing purposes, surveying 44 random patrons to determine our brand recognition rate. Doobie Central got a 16% positive response, which has given us the reassurance to continue efforts with the 420 rally. In 2019, Doobie Central will be setting up an information booth, educating people about the Doobie Central brand, and its history with the 420 rally. We will have a Quebec letter writing campaign (see Quebec freedom of speech campaign below), urging the Premier of Quebec to change their laws regarding cannabis swag, which blatantly goes against the Canadian Charter of Rights - and our right to freedom of speech, freedom of expression and our right to freedom of association. We will be giving out FREE LIMITED EDITION stickers (sticker #5 - collect them all) to the first 420 people to write a letter to Quebec as part of our WEAR A STICKER - GET A STICKER campaign. We will not be selling anything at the booth that day. The Global Marijuana March is a global event, occurring on the first Saturday in May, in hundreds of cities around the globe, including Vancouver, Regina and Toronto. While Doobie Central has historically in the past been involved with Vancouver's march (Doobie Central was a cannabis vendor at Vancouver's 2018 parade), in 2019, we will be at Toronto's parade instead. This will be the first time in nearly 15 years since Doobie Central has participated in a cannabis rally in Ontario. Doobie Central had a large customer base in the Ontario Corridor region. Our goal is to reacquaint ourselves with former customers, many who are still active in Ontario's cannabis community. We will not have a booth, but instead, will be handing out our "Cette vignette est illégale au Québec" sticker, which translates to "This sticker is illegal in Quebec", as part of our WEAR A STICKER - GET A STICKER campaign. It will be in the shape of a T-shirt, and will have the Doobie Central logo in it, along with a link to the French version of this very page that you are looking at (Don't worry, you can always click the "English" button). This is sticker #6 for those who are collecting. This will be Doobie Central's opportunity to follow up on unfinished business from the Vancouver Cannabis Expo. This is a cannabis trade show for industry professionals and consumers alike. The Toronto Cannabis Expo is Doobie Central's opportunity to further promote the brand to Ontario businesses and consumers alike. We will be giving out Sticker #1 - THE ORIGINAL DOOBIE CENTRAL STICKER (~circa 2003~), complete with the Retro Logo as part of our WEAR A STICKER - GET A STICKER campaign. In this case, if you wear a Doobie Central sticker at the expo, we will give you TWO Doobie Central stickers to take home with you. Many Ontarians will recognize this sticker, as it is a classic! These days, this sticker is better quality than the home-made sticker from back then, but otherwise identical, with the sticker being 40mm x 40mm and the centered logo being 30mm top to bottom. Cannabis Day is celebrated on Canada's birthday, July First, at Thorton Park - Main Street Skytrain Station. The event is aimed to be a Canada Day protest, to protest the current cannabis laws here in Canada. Recently, Jodie Emery was quoted calling the new cannabis laws that took effect October 17th, 2018 as "prohibition rebranded". We at Doobie Central agree! While many of our staff make a point of not celebrating 150+ years of "stolen native land", these same staff members proudly participate in Cannabis Day celebrations, protesting the injustice of Canadian Law here in Canada by lighting a spliff at 420pm at the rally with over a thousand other protesters. This year, we will not have a booth at this years Cannabis Day, but instead, be handing out a special LIMITED EDITION Doobie Central Cannabis Day 2019 sticker to 95 random participants between 3-6pm as part of our WEAR A STICKER - GET A STICKER campaign. This is Sticker #7. The date is yet to be announced, but usually, Wreck Beach Day is the first Saturday in August, which in 2019, would be August 3 (In 2018 it was postponed to the first Tuesday in September). As Doobie Central has been a Wreck Beach vendor during the years of 2004, 2006 & 2007, we will be commemorating Doobie Central's involvement with Wreck Beach culture with an official Doobie Central Wreck Beach sticker that we intend to give away to beach goers on Wreck Beach day. This will be sticker #8. While we will not be a vendor on Wreck Beach this year, we promise, we will have a Doobie Central store on Wreck Beach again at some point in the future, selling exclusive Doobie Central Wreck Beach merchandise. sticker #10 is reserved for this event. This is our #1 campaign of the year! On October 17th, 2018 - The day marijuana was "legalized" in Canada, Quebec made freedom of speech illegal. In Quebec, it is illegal to buy, sell or wear any clothing (or anything else) that either has a pot leaf or a marijuana logo. While Doobie Central marijuana would be legal in Quebec, anything on our swag page is - all of a sudden - illegal! This new law in Quebec is a violation of our fundamental rights. We have the right to "2(b) freedom of thought, belief, opinion and expression, including freedom of the press and other media of communication". Under law in Quebec, you cannot buy or sell a shirt with pot leaves OR marijuana brand logos (such as Doobie Central logos), specifically violating your freedom of expression (which includes other media of communication - such as a shirt, bandanna or sticker). One could also argue that this new law violates our right to "2(d)freedom of association" - as this law is very specifically targeting a specific group of people in our society, placing them under oppression as such that they cannot visibly communicate their beliefs supporting cannabis culture. Ironically, an anti marijuana shirt that does not have a cannabis leaf on it (such as an English language D.A.R.E. shirt) would still be perfectly legal in Quebec. We are very specifically selling a shirt that says "Cette chemise est illégale au Québec" and has a large Doobie Central logo on it. It is my desire that this shirt will be proudly worn in Quebec, in hopes that an awareness to the injustice of the law becomes prevalent. Please write François Legault, the Premier of Quebec, and tell him that you feel his laws violate the Canadian Charter and to demand that he remove this unconstitutional law immediately. If you happen to live in Quebec, please write your local MNA as well. We are handing out our "Cette vignette est illégale au Québec" sticker at Toronto's Global Marijuana March - as part of an awareness campaign to make sure that Canadians outside of Quebec know about Quebec's unjust law. We will also be conducting a letter writing campaign at Vancouver's 420 Rally - asking patrons to write a letter to the premier of Quebec, telling him how you feel about his law as a Canadian citizen. With enough awareness - coast to coast - this law will change. It will either be done by the premier or it will be done by the court of law. Please tell everyone you know, that marijuana swag is currently illegal in Quebec. The more people that know and disapprove, the sooner this law will change! Throughout 2019 at cannabis rallies and events across Canada, special collectible Doobie Central stickers will be given away to patrons, in order to help promote Doobie Central, and the cannabis activism that we do here in Canada. The idea is simple. If you are willing to wear the sticker, we will give you a sticker to take home to keep, thus essentially giving you two stickers. These stickers are durable and are meant for your laptop, cell phone case, skateboard, etc. These stickers are meant for giveaway and not for sale. That said, a few places in BC have Sticker #3 for sale at $0.99 each. We ask that these stickers are not used for graffiti. We have heard stories about Fort McMurray, that in 2004, the entire town became littered in Doobie Central stickers without our knowledge or consent. Customers received 1 FREE Doobie Central sticker with every order. We had a lot of customers in that town. We feel that placing the stickers on the backs of signs is disrespectful, regardless what the sticker says. When we give these stickers away, we generally ask people to stick them "anywhere that is legal". If you are reading this and have received a FREE Doobie Central sticker, please respect others when considering where to place this sticker. PLEASE DO NOT TURN OUR STICKERS INTO GRAFFITI. The short answer to this question is... yes, Doobie Central Peace Dollars are real. These coins are NOT issued by the Royal Canadian Mint, and therefore they are NOT valid as Canadian currency. Doobie Central coins are their own currency, with $1000 Peace Dollars (PDX) being worth exactly 1oz troy 0.999% fine gold RCM Maple Leaf Round. 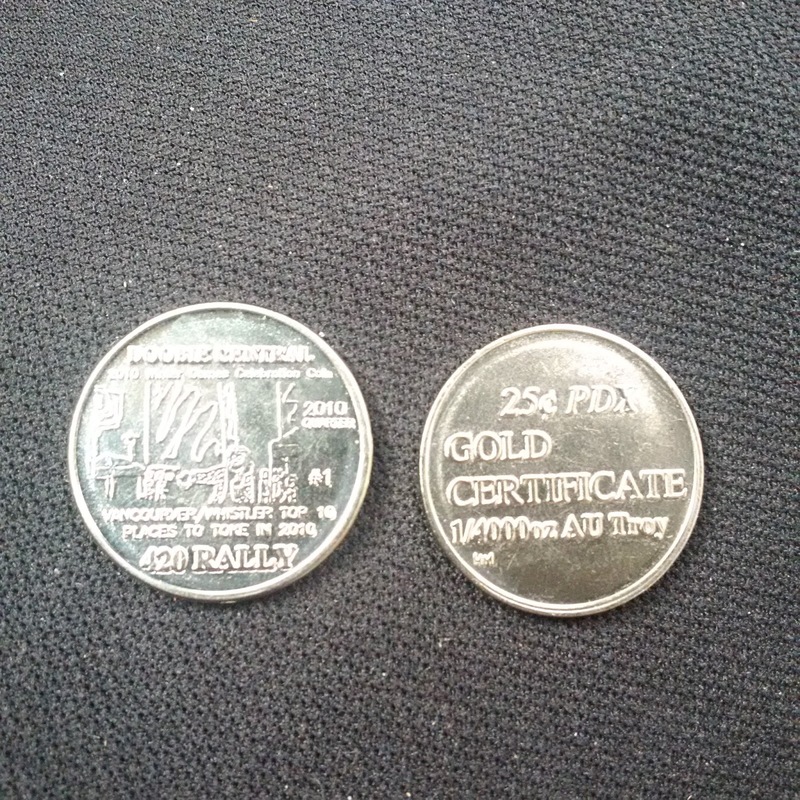 These coins are issued by Doobie Central, as well as other participating retailers. These coins are legally Doobie Central GIFT CERTIFICATES, thus making the coins legal here in Canada. 25 cent PDX coins are worth between 40-45 cents (Canadian Dollars) EACH. These coins have been in circulation for years, and sponsoring vendors accept these coins as 50 cents in trade for merchandise, which is higher than the actual gold rate :). This coin is the first of a series of 10, with 5000 coins minted. The Doobie Central 2010 quarters commemorate the winter games that occurred in Vancovuer that year. The idea of Vancouver hosting the winter games was simple: that the nations of the world could gather and assemble freely, casting aside their wars and disputes, and instead compete in sport and fun - for two whole weeks. That said, the list of 2010 top ten places to toke is for the whole year, and not just the winter games, as should be obvious by the coin itself. The winter games were in February and early March, but Vancouvers 420 Rally was clearly in April. The second quarter will be launched later this year, and 5000 coins will be minted again. By accepting Doobie Central coins as change, you are not only helping financially with the fight for legalization, you are also helping support local businesses by using these coins at select local merchants. WHOLESALE CUSTOMERS: ANY Peace Dollar (PDX) coin(s) can be used towards the wholesale purchase of Doobie Central swag. Simply give these coins to your sales representative, and the coins will be applied as a credit (at the full trade rate of 50 cents per "quarter") towards your order. 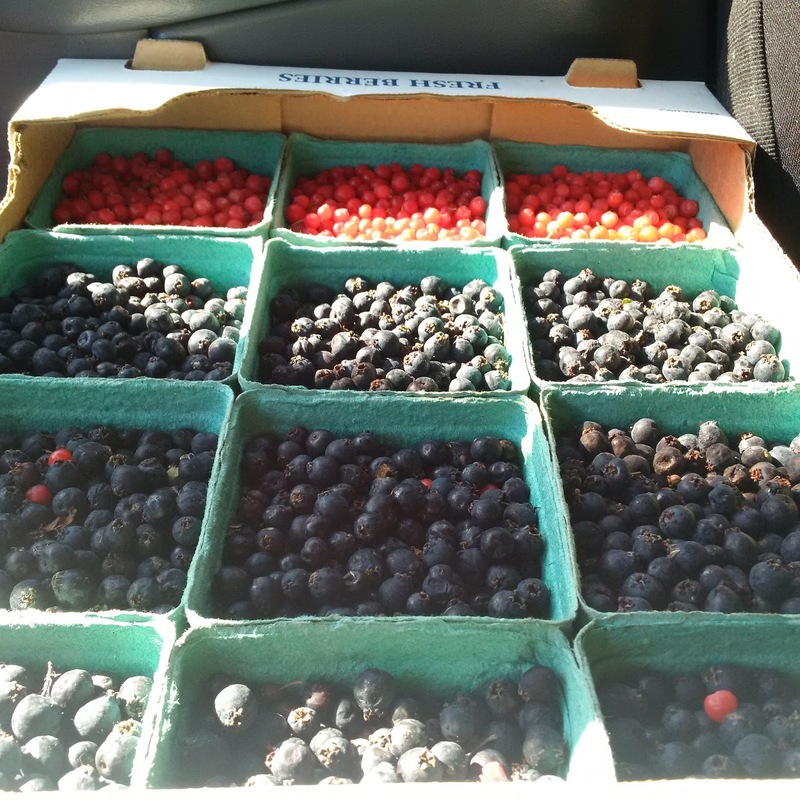 NATION OF HEDONISM sells wild food products at farmers markets around BC. The Nation of Hedonism issues, accepts and honors Doobie Central coins. Coins are valid for both retail and wholesale purchases. While AC TAXI does not officially accept Doobie Central coins, Car #23 & Van #73 OFFICIALLY accept Doobie Central coins as payment of fare at the full trade rate. Car #42 night driver Peter also accepts Doobie Central coins as payment of fare. Coins may be redeemed for GOLD at either the Doobie Central booth at the Robson Valley Music Festival OR at the Nation of Hedonism booth at select farmers markets in BC. Wholesale customers can give their coins to their sales representative with the instruction to redeem for gold. Coins may be redeemed for CANADIAN DOLLARS at either the Doobie Central booth at the Robson Valley Music Festival OR at the Nation of Hedonism booth at select farmers markets in BC. Wholesale customers can give their coins to their sales representative with the instruction to redeem for cash. The coins will be converted at the XAU (gold) exchange rate, and a 5% exchange fee will apply. Each coin is currently worth a little over 40 cents Canadian Dollars each, after the 5% commission has been applied to the exchange.